However, while the goals and priorities for most B2B brands have evolved over the past three to four years, campaign structures and mindsets have not. 68% say they are more focused on conversions rather than acquiring hand raisers. In addition to being more targeted in their campaigns, other go-to-market strategies are also rewriting the traditional rules of B2B campaign creation. For example, many service and SaaS-based software companies are putting more investments towards customer marketing, with retention, cross-sell and upsell goals becoming a bigger revenue priority. Yet, despite all of these changing and diversifying of revenue goals for B2B organizations, most campaigns are still amazingly similar. Regardless of whether brands are building programs for existing customers, a select group of prospects or are looking to acquire prospective buyers with a budget — the process still looks the same of featuring an offer and pushing them to a CTA that usually includes a landing page and a form. Gates and Forms: We have written a lot about the debate on whether to gate content offers, but as a starting point I would argue that all B2B brands should review their current content engagement experiences and challenge whether they really require a form in front of every asset. Eliminating Dead Ends: A majority of campaigns I see still focus on singular CTAs — asking an audience to register for an individual webinar or download a single asset — without any thought to the questions a buyer might have or what the next steps in a logical buyer progression should be. For example, if an influencer is engaged with a campaign and is looking for other resources/assets that could help them build a business case to convince their boss or other decision makers, it’s important for campaigns to point beyond a single CTA. Ultimately, most marketing teams are being asked to support different go-to-market strategies and are being measured against different goals. 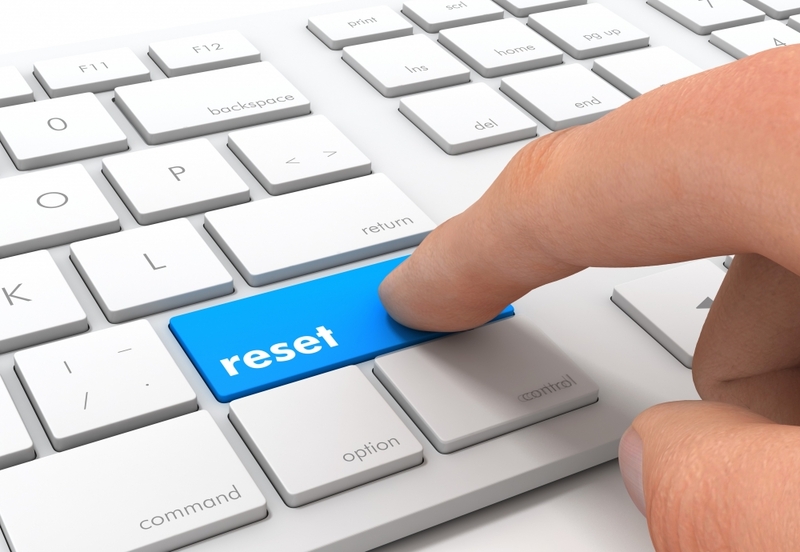 Therefore, it’s a perfect time to reset campaign structures and redesign the experience with the buyer in mind. Focus more on making it easy for buyers to engage with your brand, and less on frisking them for information before they can access your next webinar or read your next E-book. One of those companies, Drift, has been leading the charge in the conversational marketing discussion taking place in the B2B marketplace. The company’s new integrations with Marketo better position marketing teams to bring a more conversational approach to their account-based strategies by tying insights from conversations with stakeholders back into Marketo towards those accounts. I had a chance to chat with David Cancel, CEO and Co-Founder of Drift, on the show floor at the Adobe Summit. He shared his thoughts on the new integrations with Marketo, the ongoing trend of conversational marketing, as well as the growing consumerization of B2B as the line with its B2C counterpart continues to blur. Demand Gen Report: Conversational marketing is something that a lot of B2B organizations have struggled with. When it comes to the announcement of Drift’s integration with Marketo, what is your perspective on how this partnership will impact the community? David Cancel: I think we all struggle when there are big shifts in the landscape. I've been in the marketing world long enough to have witnessed a bunch of [shifts], like when we went from mostly offline to digital marketing. The whole idea of digital marketing blew people's minds! Then we went to creating content and blogging and inbound [marketing]. Content marketing also blew people's minds, because you had a whole generation that were like, “I'm going to write a blog? What am I going to write about? What if I do something wrong?” They didn't know how because they weren't native in it. And then there was a whole next generation of markers that were native in content marketing. Now we're seeing the same thing with conversational marketing. We have people who are what we call “conversational natives” because they've grown up on messaging. This is just normal to them. And they're actually teaching this older generation — these business leaders — how to do it. This is the way that young conversational native people interact everywhere. The thing that we're focused on with this integration with Marketo is that marketing and sales do all their hard work, but still bring [prospects] back to an anonymous visit and interaction model. They spent all this money, got the swag, sent them the gift and had the meetings, but when they come back to their website, it's still the same generic website. It should be comparable to real-world interactions. That's just a natural human pattern. How do we treat all those VIPs with a personal experience? It sounds simple, but up until now it has been kind of impossible. We’re using conversations to accelerate the sale because no sale ever happens until you have a conversation. We’re looking to accelerate conversations instead of deflecting them. DGR: Another key takeaway from the event was that Marketo is aiming to help users identify key anonymous stakeholders. What is Drift’s role in that? Cancel: The first thing that we do is leverage the Marketo cookie so that we have any identifier that's already available. We also instrument any third-party sales outbound tool that may be used, such as Outreach or SalesLoft. Let's say a marketer didn't send out a nurture flow, but I'm a sales rep that sent out a flow. We have the instruments so that, when prospects come back, we know what rep had sent that out and who the identity of that person is. We then pass that back to Marketo. We're catching the sales outflow, as well as the marketing outbound, and unifying that in the Marketo contact database — and, of course, linking that back to whatever CRM is being used. DGR: Over the past couple of years, we’ve seen companies like Adobe and Marketo starting to understand the importance of buyer experiences. As the CEO of one of the bigger contenders in the conversational marketing space, what's your initial interpretation of the trends you're seeing within these big brands? Cancel: I think when we started out and started thinking about this category, we thought, “what if we're not even remotely on the right track?” Now that we set this timeline that came true, every one of these companies of every size — whether it's Salesforce, Adobe or Marketo — have to have a conversational kind of answer because this is what's happening in the world. That was the basis of what we started. The user behavior has already changed. Now, it's been changed in the buying cycle, as well. People are buying all over the world via messaging interfaces, and we're just basically catching up now on the B2B side of things. But again, we have the weight of martech’s history on our shoulders. So, for us, what we do today, which is not conversational, seems normal to all of these older generations. It's not normal — this idea of filling out forms and nurturing is the most boring thing because they could buy everything on demand. We're now taking a behavior that has already happened and bringing it in to the B2B space. DGR: Another key theme at the event is the whole idea of the blurring of the lines between B2B and B2C or even having that type of conversation. What is Drift’s stance on the trend? Cancel: We've been talking about consumerization of the enterprise for at least 10 years, maybe 12 years from what I can remember. But now it's finally true. It wasn't true even five or six years ago. You walk into every company now and anyone can make a buying decision. It might be a micro-buying decision, but they're making a buying decision. Why that's important is that this is the first time you have a wave of people who are not professional buyers. They're not procurement, and not a CIO or CMO. They're not used to going through these buying processes. So, they want to buy like they buy normally. At the same time, we saw the subscription and “SaaS-ifying” of everything, which takes down a lot of the competitive moats that existed before. So now in any category, you're not only competing with one or two other vendors, you are competing globally with hundreds — if not thousands — of vendors. So, you have infinite choice, you have people that are not professional buyers and want a consumer-like experience, and you have all these things coming true at one time. This is why we’re seeing this shift from companies having more control of the buying process to the buyer. DGR: Can you share any forward-looking thoughts on where you see Drift headed? Cancel: The way that we think about it is that we did one major thing, which was in the way that we thought about the company. We don't think about ourselves as a company that helps you provide software to help you sell more, we inverted the model and said, “we are focused on one thing, which is helping the buyer buy.” If we help the buyer buy and they're delighted because of all the powers moving in their direction, then you have better company dynamics and better sales performance. It sounds fluffy, but it changes the whole perspective. In terms of where we're going, we're just following the buyer down the entire process from awareness to purchase, and saying, "how would we rethink these things? What doesn't make sense anymore? What does make sense? Where do we integrate? What do we think?" You’ll see us staying close to the revenue side of things. That's how we measure our stuff. I mean, we've gone from having a goal of like, how does Drift influence 100 billion in revenue by this time? Now we're thinking about how do we get closer to that revenue and not only influence it, but how do we get deeper in that in the buying process? You'll see us following that stuff along. /Webcast series have become popular in the marketplace, aiming to provide a “binge-worthy” content option for target audiences while offering a different format that is more engaging and valuable. We here at Demand Gen Report, as well as all our brands under the G3 Communications umbrella, believe that the key to a successful webcast series lies in first defining production and promotion processes that are scalable, repeatable and flexible. Like with any content strategy, understanding and building a plan around a particular theme is vital to brand consistency and ensuring the main messages and takeaways that want to be addressed are the highlight of the webcast series. According to Butts, the main theme is what drives the entirety of the webcast series’ production schedule. “The theme is going to not only help you determine a cadence for your sessions, but also what some of those sessions are going to look like — what format you will use, who can tell that story, what content will support it,” Butts noted during her session. Partners, who may share a common interest, goal and/or following. Butts also stated that while you’re concurrently thinking about your theme, format and speakers, you may also want to consider a piece of content (or multiple pieces of content) that you can reference throughout your series to help tie all your sessions together. Of course, developing a good theme is just the very beginning. To help guide fellow webinerds through the comprehensive process, Butts shared an awesome checklist that dives into the nitty gritty of kicking off a series, planning out promotion, rehearsal and production, tactics for when the series is live, post-series follow-up, as well as ongoing measurement of campaign success. And speaking of webcasts, you can catch one of Demand Gen Report’s series in action this month, by signing up for the Campaign Optimization Series: What’s Working In B2B Marketing, which will take place April 22-26. 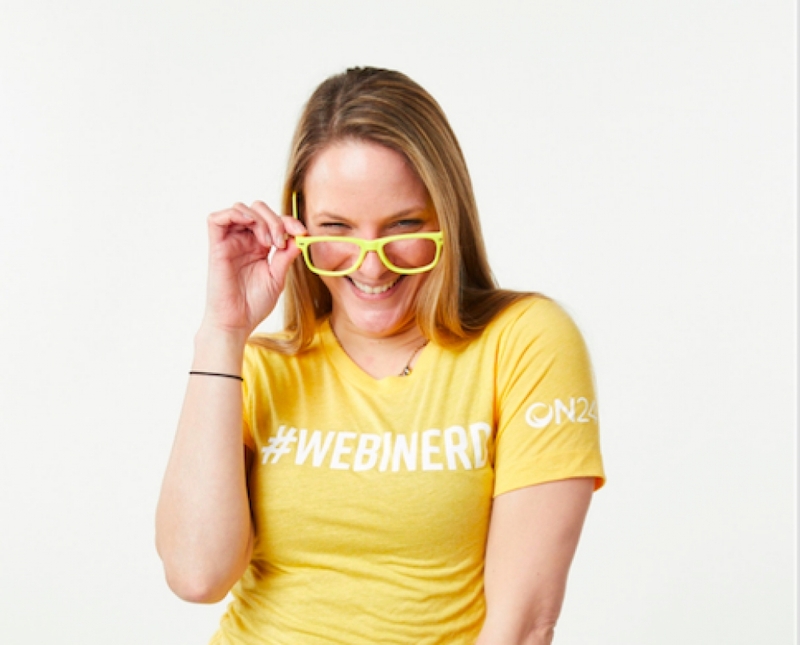 What intrigues you the most about webinar series? Leave a comment below to let us know what your favorite webcast tips and tools look like. Sigstr aims to transform the millions of emails B2B marketers send through Gmail or Outlook into a targeted marketing channel and source of relationship-based intent data that gives marketers control, influence and visibility into the entire customer journey. 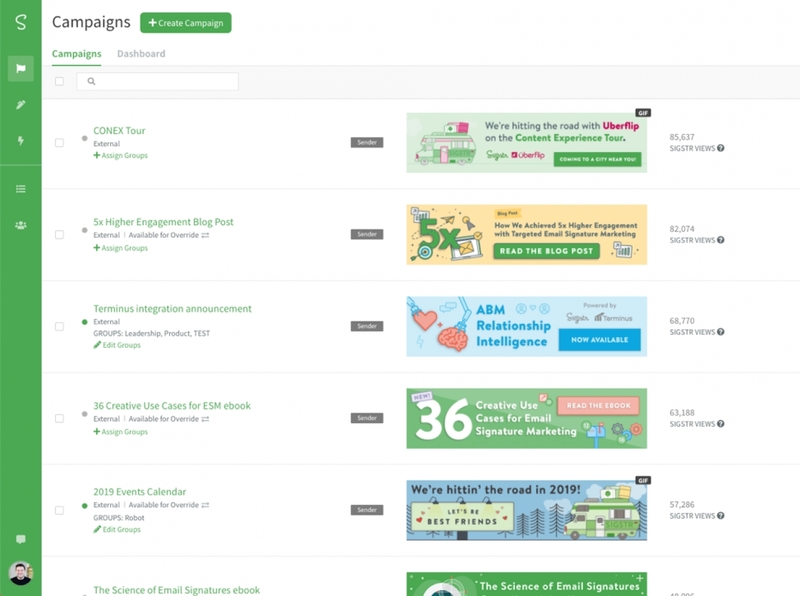 Sigstr is designed to enable B2B companies to add dynamic, call-to-action banners into every email their employees send. It is positioned to let users run dozens or hundreds of simultaneous campaigns to automatically target and influence their most important audiences with relevant content. By being in the flow of every email that is sent, Sigstr is positioned to map and quantify the universe of relationships a company has with its audiences and provide visibility into engagement levels throughout the customer journey. The solution also aims to give marketers global control over contact information and disclaimers across the entire company, easily adapting to complicated organizations with multiple business units or office locations. The platform is designed to help marketing teams at any company gain full control over the signature area of those emails, turning them into a marketing and analytics channel. Sigstr offers integrations with every major marketing automation platform and CRM, as well as rich integrations into content, ABM and sales automation platforms such as PathFactory, Terminus and SalesLoft. Sigstr is a cloud-based solution that is priced per user. Exact pricing varies depending on the total number of users and features requested. Customers include Snowflake, AT&T, Cvent and more. Sigstr is designed to give marketers the control over the inbox they need to gain visibility and influence over the entire revenue journey. Its enterprise capabilities, integrations and powerful interface were built with the marketer in mind. Aprimo Productivity Management is a marketing resource management solution designed to simplify collaboration to increase the speed-to-market of campaigns. It aims to help marketers streamline valuable assets and deliver content, campaigns and experiences faster across all channels. Ideation: Capture ideas, tactics and strategies and automatically connect them to Productivity Management for execution. Activity Management: Get a single, roll-up view of what’s happening in marketing at any given time. Workflow Automation: Automate the process of taking requests and managing workflow. 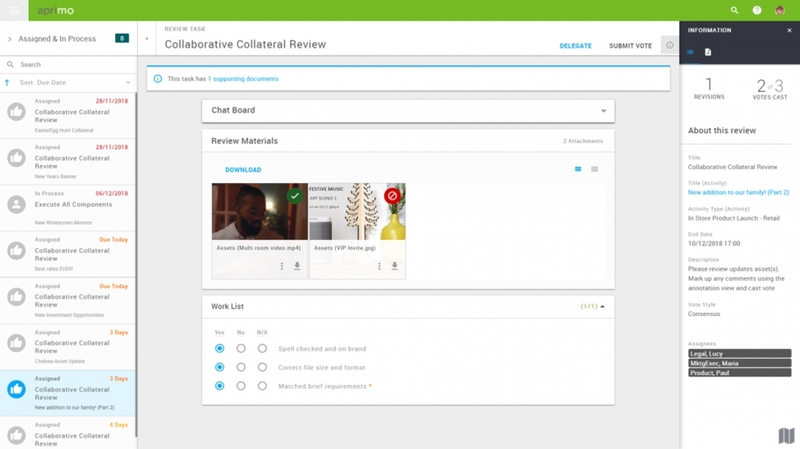 Collaboration: Bring ad hoc and structured conversations into your system so users are connected and up to date on their work. Content Review: Provide 100% assurance that the right person is reviewing the content at the right step in the process. Annotations: Digitize the mark-up process and provide actionable feedback with several intuitive annotation tools. Insights and Analytics: Get performance insights to help manage your team’s workload and take action for maximum, sustainable effectiveness. The solution primarily targets marketers in the financial services, high-tech, manufacturing, consumer product goods and retail industries. Aprimo Connect is a comprehensive framework of pre-built connectors, low-code integration connections and developer tools that enable the solution to connect with Oracle, Salesforce, SAP, ON24 and more. Pricing for Aprimo’s SaaS solution is subscription based on the number of users. Aprimo Productivity Management aims to help businesses optimize work, resources and spend so they can optimize ROI. Its AI-backed capabilities, which include intelligent workflows, automated task routing and agile boards, help marketers deliver content and meet goals faster than ever before. Here are a few of our favorite #KeynoteInks from this year’s B2B Marketing Exchange. What keeps your customers up at night? That’s a question that we should be considering when formulating a content strategy. During the keynote session with 3M’s Carlos Abler, he shared this memorable quote highlighting the current state of B2B content. Another common theme of the event was that B2B brands have to be more authentic, show emotion and make genuine connections with their prospects. Comedian and former IBM content leader Tim Washer said during his opening monologue that this can easily be done using laughter to connect messaging with real human emotion. Another method for creating genuine customer experiences is giving your brand’s fans a platform to share their experience with you. Best-selling author, speaker and industry expert David Meerman Scott noted in his keynote that it’s time for brands to lose control and let their fans take over. He highlighted The Grateful Dead, and how they let concert attendees bring recording equipment to shows — which ultimately led to the band’s almost cult-like following. When it comes to content strategy, the often-quoted stat about today’s buyers having the same attention span as a goldfish is considered — leading to more straightforward and to-the-point content. However, millennial expert and industry consultant Brian Fanzo noted during his session that, if you have great content, the rule doesn’t apply! You can see this in the growing popularity of lengthy podcasts and video content binging. As the B2B buyer continues to evolve to look more like a B2C consumer, it’s vital for B2B businesses to position their buyers to take the reins and have control over their own buying journey. Forrester’s Steven Casey used the phrase “helicopter marketing” to describe how today’s marketers are always hovering over their target audience — when in fact they should be encouraging them to educate and buy at their own speed. And we’re looking forward to next year! 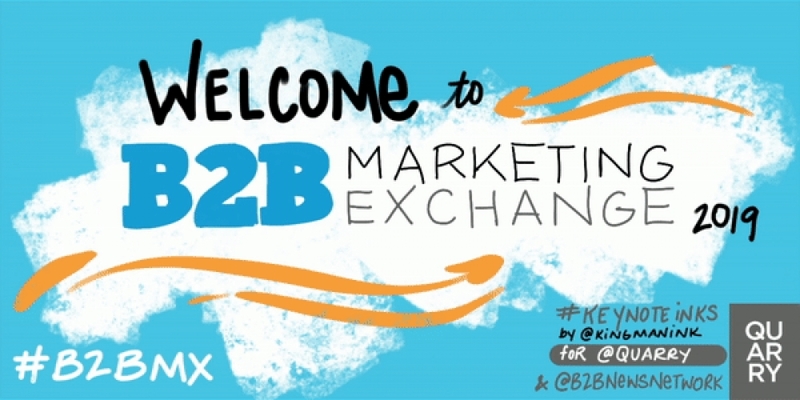 Stay tuned to the B2BMXpert community for updates on our other upcoming events and details about the 2020 B2B Marketing Exchange, slated for February 24-26, 2020! Check out all the other #KeynoteInks from the B2B Marketing Exchange here! 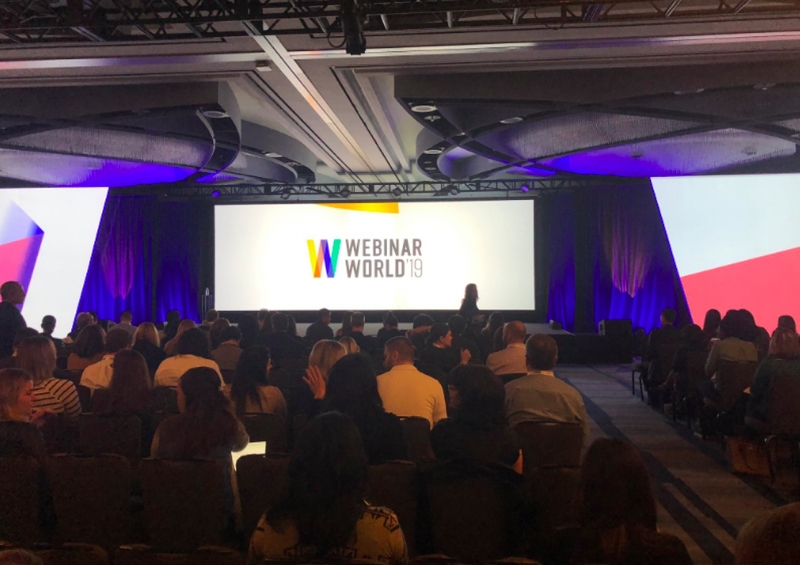 The idea of a physical event focused on webinars is a bit ironic, but the more than 600 attendees that gathered in San Francisco this week for the third annual Webinar World demonstrated that the evolution of online events is having a fundamental influence on overall content and marketing strategies. Hosted by ON24, the event featured thought leadership from top influencers in B2B, uses cases from a variety of industries, as well as a string of announcements around new products, partnerships and approaches designed to help marketers get ahead. Sharat Sharan, CEO and Founder of ON24, explained to Demand Gen Report that the focus of Webinar World continues to expand and evolve to meet the changing needs of both marketers and buyers. Sharan added that the audience and influence of the event has continued to expand as well. Last year, Webinar World drew more than 2,000 attendees across four different events in San Francisco, London, Sydney and Singapore. He attributed the growth of the event in part to the challenges that marketers are having in creating content that stretches beyond clicks and opens to drive “human engagement” with a targeted audience. At the event, ON24 unveiled the results of a new a study from Heinz Marketing, which found marketer’s confidence in certain tactics has faded over the past two years. The study, which surveyed nearly 150 respondents representing a range of industries, found that 63% of marketers said their content marketing strategy was either not very effective or only somewhat effective, compared to just 35% in 2017. In addition, two-thirds of respondents said they were either not confident or only somewhat confident that their content is driving revenue results. Content Journeys is a suite of new features designed to drive ongoing engagement and create meaningful customer experiences. The expanded capabilities are designed to help marketers gain further insights and feedback from customers, help facilitate a two-way conversation and create a fully customizable digital experience for customers. Content Journeys provides marketers with new capabilities such as ratings, comments and customizable CTAs. Since measuring the impact of content and understanding what messaging is resonating with buyers is also a top priority for marketers, ON24 debuted Content Insights. 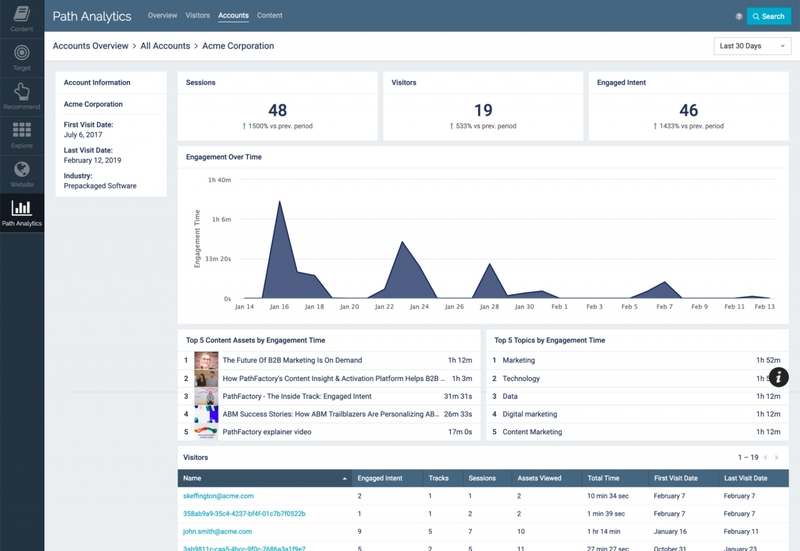 It is available for ON24’s Engagement Hub and Target products and aims to help marketers optimize campaigns based on intelligence and insights. One interesting feature of Content Insights is its ability to measure attentiveness as part of its Prospect Engagement Profile, which extends beyond the traditional metric of tracking viewing time. Other features include a rating system to track likes and dislikes on pieces of content, comments, as well as unique visitors and top accounts viewed. With more marketers focused on measurement and looking to integrate data from digital experiences into their core marketing platforms, ON24 also announced an expanded partnership with Marketo, an Adobe company, at Webinar World. The partnership is designed to help marketers deliver an end-to-end demand generation solution by integrating with the webinar channel. Sharan explained that the multi-year agreement is positioned to help provide increased value to the thousands of customers who already use ON24 and Marketo to engage and understand their audience. Mika Yamamoto, VP Customer Success and Digital Experience at Adobe and former President of Marketo, delivered a keynote address at Webinar World. During it, she emphasized that more marketers are focusing on revenue metrics to better align with sales. She explained that the partnership with ON24 will help marketers uncover real engagement data from their campaigns. "Data is integral to enabling marketers to deliver outstanding customer experiences and ultimately shareholder value," Yamamoto said. "Through our collaboration with ON24, we will be able to give marketers deeper insights into their customers, helping transform their funnel and positively impact their bottom line." The two companies announced that Marketo has selected ON24 as its global webinar provider and will use the behavioral intelligence provided by the ON24 Platform to help inform its own audience engagement strategy. ON24, a customer of Marketo for more than five years, will become a member of the Marketo Partner Advisory Board. The two companies formalized an agreement to work together to innovate their synergistic technologies, making it easy for marketers to adopt and realize the value of engagement data. Contentstack is designed to combine the best of content management systems and digital experience technology in a unified platform. It is positioned to help enterprise organizations manage content across digital channels and create amazing digital experiences. 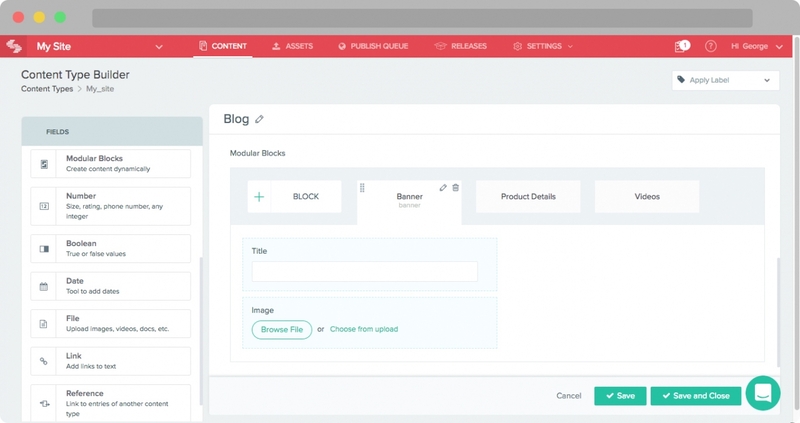 The Contentstack platform aims to help businesses develop content hubs and publish content to all their digital channels, including web, mobile IoT and chatbots. The platform is designed to automatically optimize content for each screen and device. Additional features include content previews, approval workflows, digital asset management, multi-language capabilities and more. Built for enterprise-grade scalability, reliability and security, Contentstack is ideal for global publishing teams with complex content structures, where content needs to change at the speed of the business while also conforming to strict policies. Contentstack offers turnkey integrations with external systems and leading industry tools, including CRM and ERP systems like Salesforce and SAP. Businesses can start using Contentstack at $3,500 per month and upgrade as their needs grow. A free trial and more pricing information is available here. Customers include 8x8, Cisco, VMware and more. Contentstack is designed to address the needs of enterprise companies and empower them to improve content management for both new and old channels. The platform blends content management and digital experience technology to enable omnichannel content, digital experiences and personalized customer journeys at scale. /B2B buyers are increasing turning to peer reviews (65%) and social media (47%) to cut through marketing speak and gather honest, relevant insights during their decision-making process. Marketers must adapt to these changes and embrace conversational strategies that enable them to reach the modern B2B buyer. This topic will be highlighted in detail at the ABM Innovation Summit, held March 14-15 in San Francisco. Drift’s VP of Marketing, Dave Gerhardt, will be speaking at the event and shared a sneak peek into his session. In an exclusive interview with Demand Gen Report, Gerhardt discussed how conversational marketing can help B2B companies get ahead in a digital age, why VIP customer experiences are table stakes and more. Demand Gen Report: What are your current thoughts on the account-based landscape, particularly in the B2B marketplace? Dave Gerhardt: ABM is a term that’s been everywhere, but I think it’s always been a key part of marketing. One of my favorite books is called “The Ultimate Sales Machine” by Chet Holmes. He talks about the concept of “the Dream 100,” which is that every business should have a list of their top-100 dream clients hung up on a wall. There’s been so much thought about ABM, but when I read that book, I thought, “that’s really what ABM is, right?” We all have some subset of people that we want to buy from us because we think they’re a good fit. ABM is just about targeting those people. The part that I’m super excited about and I’ll talk about at the event is that conversational marketing piece. So many companies are doing ABM and they have an ABM strategy, but when they actually drive traffic to the website, they treat those accounts just like everybody else. That’s like going out and promoting an event to yourVIP prospects and customers,but when they get to this front door, they have to wait in line, which is crazy. I think the biggest thing that’s changed in the last couple of years is that because information is free now and there’s so much competition in any market, your buyers have all the power and you have to meet them where they are. That means having conversations with them in real-time, when they are on your website. DGR: It’d be great to get a little bit of an overview of what your session is going to entail and how conversational marketing is starting to become important when it comes to an account-based strategy? Gerhardt: My whole session is about real tactics. I call it “15 Conversational Marketing Examples That Would Give Your Business An Unfair Advantage In 2019.” That’s not a click-bait title because it’s real. If you take advantage of the things that I’m going to show in that presentation, you are going to be able to run laps around your competitors because you’re creating a fast lane for the best people that visit your website. I will talk about why Blockbuster went out of business, why Borders went out of business, why taxi cabs have basically become irrelevant and what that has to do with your marketing strategy. Then, I will show you 15 very specific examples of plays you can run on your website. A couple of them are specific to ABM, but I want people to walk out of there with a new perspective on what they could be doing on their website. It will include some new ideas for ABM and overall ways you can boost conversions on your website by focusing on conversations that are more sufficient. DGR: One of the things that caught my eye the most was around the idea of providing every visitor with an experience that leaves them feeling like a VIP. Based on your view of the marketplace, why has offering this type of a VIP treatment become table stakes? Gerhardt: There are two reasons. Number one is options and number two is information. On options, there’s more competition and more noise than ever before. As a result, customers don’t have to wait in line to talk to you. I do this all the time. If I’m going to go buy new webinar software and I go to that company’s website and I can’t get an answer, what do I do? I go to Google and I type in their company’s name and alternatives. Or G2 Crowd shows me a different product to use. I do this even on my phone. I have Uber and Lyft on my phone and every time I take an Uber, I pull up Uber and I pull up Lyft to see who’s going to get me there the fastest and I go with that one. The same thing is true for how people buy. Because there are so many options now, you have to meet customers where they are and match how they want to buy and not control the buying process. The second point that I mentioned is information. There’s more information available than ever before. Content is now table stakes. Every company has a podcast, they’re doing video, on social media, has an email list and has a newsletter. You can’t just win by having content anymore. We now live in a world with infinite supply. There’s an infinite number of competitors and an infinite amount of information. You have to treat people like they have most of the information before they go to your website. There are so many studies from the Boston Consulting Group, to Forrester, to the Harvard Business Review, that are all saying 80% of the buying process is done by the time somebody gets to the website. Think about how you buy, but then think about how most websites treat you. They treat you like this is the first time you’ve ever heard anything about their business. DGR: What are you hoping to learn more about at the event next week? Gerhardt: I try to go to every event without a plan because I just like to be there and talk to people, and the best learning that I get is when I’m around other marketers like me who are doing the same thing. I’m most interested in hearing about what challenges people are facing. I know that sounds like a cliché, but the best stuff that I learn is when I’m around other marketers who are doing the same thing that I’m doing. It’s like therapy, where everybody is talking about what’s happening in their life and that’s where we can figure out where our stuff fits in and how we can be better at marketing and sales here at Drift itself.